Meetings are held the second Thursday of every month at the Highwood Community Hall, 16 Harlow Ave. N.W., Calgary, AB. Doors open at 6:30 p.m. and the meeting begins at 7:00 p.m. 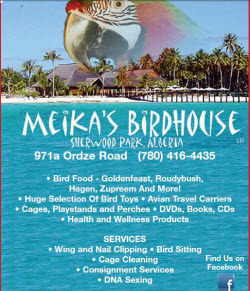 Doors may remain open during the evening, please be cautious upon entering as parrots in attendance will not be in carriers. If you don’t know anyone, just introduce yourself! We are a casual, friendly group and love seeing guests and new members at Club meetings! Guests are welcome to one complementary meeting. 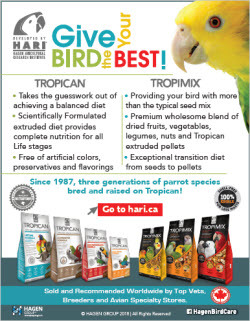 Meetings may feature a speaker or presentation, an educational/resource table, as well as time to socialize and meet the parrots and their guardians. Raffles and 50/50 draws may be featured at some of the meetings. All monetary transactions are cash or cheque, no credit is extended. We strive to make each meeting as informative, interesting and informal as possible. In addition to a variety of knowledgeable and professional speakers and demonstrators at the monthly meetings, we host a June and December potluck event. 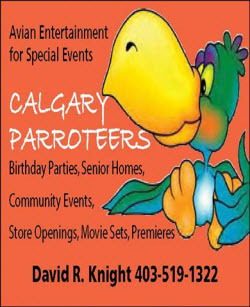 a) the person bringing the parrot is a member in good standing. c) the parrot must be under control at all times, either by having wings clipped or by harness. 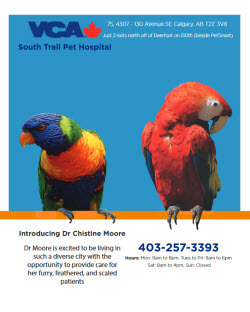 Flighted parrots that fly during meetings may be requested to be placed into their travel cage for the duration of the meeting. d) you clean up after your parrot. 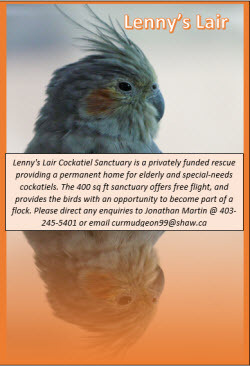 e) you do not leave your parrot unattended. 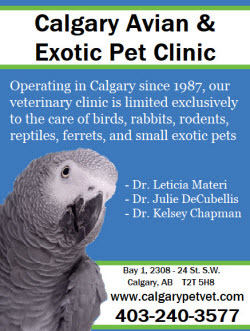 The Calgary Parrot Club and its board of directors does not assume any liability, therefore your parrot visits are at your own risk. Please remember parrot etiquette (a parrot etiquette sign is posted at each meeting, please respect your fellow members and their parrots by following the Club guidelines). Look, but don’t touch without permission from the owner. 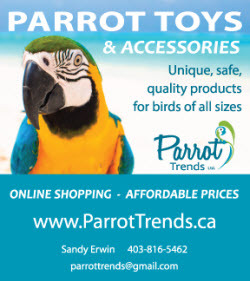 Remember parrots can bite and are handled at your own risk. 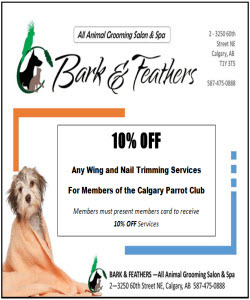 The Calgary Parrot Club and its directors assumes no liability. 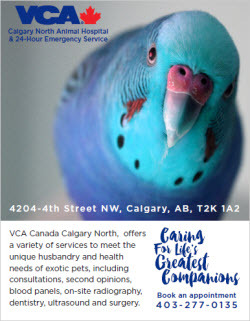 As a guardian if you are aware your parrot has a tendency to bite please be responsible and do not bring to Club functions. 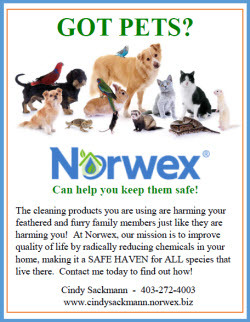 Wash your hands with antibacterial cleaner before and after handling anyone’s parrot. To become a member, please fill out the membership form and mail it to us along with your cheque or bring your completed form and payment to a meeting. The membership fee covers the entire calendar year. If you have any questions about how meetings operate, don’t hesitate to contact us.